The Alaskan Coastal Wilderness | Bannor & Bannor Inc. The Alaskan Coastal Wilderness | Bannor & Bannor Inc.
Beth and I took an amazing trip a few weeks ago, a small ship cruise through the islands and fjords of southeast Alaska. Simply grand scenery. Wildlife from bears to sea lions to whales abounds. You can read our expedition journal here or browse photographs here. 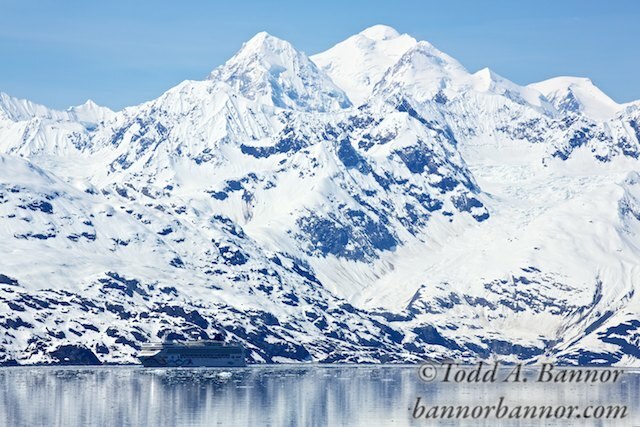 The photo above is of 15,325 foot Mount Fairweather from Glacier Bay. The ship isn’t ours, it’s the Norwegian Pearl, one of the two megaliners allowed into the national park per day. Our ship, the Sea Lion, at about 150 feet in length is relatively tiny. In fact, I imagine a couple of the dinner cruise boats in Chicago are bigger. But its small size lets it go where the big ones can’t and that makes the trip an adventure. If you ever have the chance to take this trip, we highly recommend it. You can hike, take Zodiac cruises and kayak. The guides and naturalists are great. One naturalist is a diver who takes video of the undersea life and presents it while you relax in the lounge. It’s the trip of a lifetime.